A Boston Marathon Interfaith memorial service, “Healing Our City”, was held at Boston’s Cathedral of the Holy Cross Thursday, April 18. It was a service that concluded with remarks delivered by President Barack Obama. The service included a local children’s choir, prayers and remarks by political and religious leaders. The service was held three days after two deadly explosions struck cheering bystanders at the Boston Marathon’s finish line. Three people died, two young women and an 8-year old boy, all of whom were spectators cheering for the runners. As many as 176 were injured, some of whom will lose one or both legs. Thursday’s memorial service was held to mourn the dead and support the wounded. The service included Christian, Muslim and Jewish religious leaders. Prominent state and local leaders were present, including Mitt Romney, the former governor of Massachusetts and Obama’s rival in last year’s presidential election. Governor Patrick also praised the city for its “resilience and its compassion”. A twenty-year-old man who had been watching the Boston Marathon had his body torn into by the force of a bomb. He wasn’t alone; a hundred and seventy-six people were injured and three were killed. This young man was the only one who, while in the hospital being treated for his wounds, had his apartment searched in “a startling show of force,” as his fellow-tenants described it to the Boston Herald, with a “phalanx” of officers and agents and two K9 units. “Let me go to school, dude,” the roommate said later in the day, covering his face with his hands and almost crying, as a Fox News producer followed him and asked him, again and again, if he was sure he hadn’t been living with a killer. What made them suspect him? He was running—so was everyone. The police reportedly thought he smelled like explosives; his wounds might have suggested why. He said something about thinking there would be a second bomb—as there was, and often is, to target responders. If that was the reason he gave for running, it was a sensible one. Juan Cole writes that CNN was especially egregious in its desire to finger a “dark skinned” man, media-speech for Muslims, a hint directed at Islamophobes among its viewers. The so-called “Saudi man” was in the hospital. He may well have suffered “severe burns”. But that would be the only part of the Fox-Post narrative that proved to be correct. By Thursday afternoon, the FBI reported that it had identified two suspects, both of whom were identified in video footage. At right in a FBI picture is one of the suspects. This was an emotional week for the nation, and especially for Boston. Grief-stricken and angry citizens must be handled with care at such a time. News reports that later must be corrected, have a way of feeding a false narrative that hangs around until they morph into “false flag” memes, stories that emerge as conspiracy theories. What really matters in this week’s events is that once again indiscriminate evil struck. The impact of such attacks reaches all of us at some level, beginning with the immediate families of the dead in Boston, and then radiating outward to the entire human community. 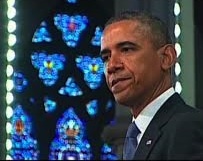 President Obama and other speakers at Monday’s interfaith service, rose to the occasion to inspire the nation. In contrast, some conservative media outlets rushed to judgments that were irresponsible and damaging to the innocent. It is better that we end this week lifted by the power of faith, not dragged down by the destructiveness of revenge. 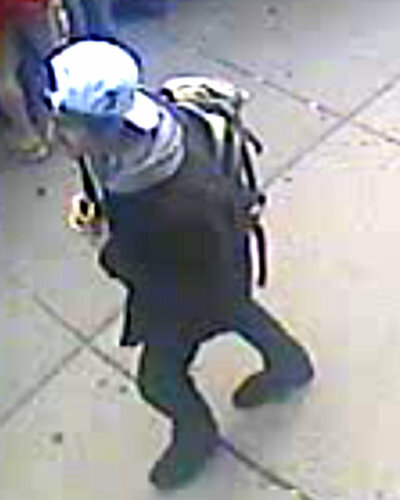 The surviving suspect was identified as Dzhokhar A. Tsarnaev, 19, of Cambridge, Mass., a law enforcement official said. The suspect who was killed was identified as his brother, Tamerlan Tsarnaev, 26, the law enforcement official said. Investigators believe that both of the suspects were Chechens. Media is identifying both Boston suspects to be from a Russian region where about 20% population is Muslim. Islamopobes were already blaming Muslims. At least two Muslims in Boston including a physician were beaten and a popular imam Webb was not allowed to speak at the interfaith service in Boston. Muslims need to be ready for another round of generalization of our community. If your masjid needs a press release, talking points, khutba notes, our team has prepared them for you. This entry was posted in Religion and politics, The Human Condition. Bookmark the permalink. Thank you, Jim. Your message was one of hope that mainstream America remains as a compassionate people, who do not come to conclusions prematurely, and who choose the path of the rule of law. The cowardly terrorists who tried to kill as many people as possible, not only committed a despicable evil act, but also self-defeated any message they could have possibly entertained in their warped minds. May God bless the victims and their families and may He uplift and bless the brave people of Boston. As always, Jim, thanks. As I was sitting in my favorite little restaurant in East Jerusalem with its Palestinian owner the next morning, watching BBC, he said quietly, “Pray God it wasn’t an Arab ….” He and his fellow Arabs are all too accustomed to being cast as terrorists. Jim Wall’s report is the first well-rounded commentary we have seen as we travel in Jordan and Palestine. We deeply appreciate this compassionate and positive approach. I wish we had been able to hear President Obama’s remarks: they must have been stirring. My prayers go out to the victims and their families in Boston, in drone strikes in Pakistan and Yemen, and in the US-led massacre of 11 children ages 1-12 in Afghanistan earlier this month. As Archbishop Tutu recently noted about targeting non-Americans, “Do the United States and its people really want to tell those of us who live in the rest of the world that our lives are not of the same value as yours?” This applies to the targets of our prayers, blogs, articles and love. Somehow I think God doesn’t distinguish between those targeted, whether in the US or by the US. Let us not divide them in our hearts, but unite them in our prayers.